Colleagues with experience of the same / similar difficult conditions of teaching can be seen as a major source of insights for appropriate, context-sensitive teacher development (see Smith, Padwad and Bullock 2017). Solidarity and confidence can be built from the bottom up through a focus on success but also on sharing support. Insights into a particular issue can be gathered systematically via a group-based teacher-research project (ibid. ), via individual teacher-research projects supported within a Teacher Association (cf. recent AINET experience highlighted below), and/or via 'Teacher Association research' (Smith and Kuchah 2016; Kuchah and Smith 2018). [Update, October 2018] On 5 October (World Teachers’ Day), Richard Smith, Deborah Bullock and Amol Padwad presented ‘Ideas and strategies for the low-resource classroom’, a 1-hour British Council webinar for teachers, teacher educators and school leaders around the world. They referred to ideas from their book, Teaching in Low-Resource Classrooms: Voices of Experience, and, during the webinar, interviewed Sagun Shrestha about the recent Success Stories conference he organized in Nepal. In its (2018) Action Agenda for the Future of the TESOL Profession (p. 18), TESOL International Association featured the CAMELTA-research initiative as a case study of how Teacher Association Research can have an impact on preservice teacher education. Kuchah, K. and Smith, R. 2018. 'An invitation to Teacher Association Research'. ELTED Journal 21: 64-71. Ekembe, E.E. and Fonjong, A.S. 2018. 'Teacher Association Research for professional development in Cameroon'. ELT Research 33: 28-31. Kuchah, Harry K. 2018 'ELT practitioners and professional organizations working in challenging circumstances' Presentation in the TESOL Research Professional Council colloquium 'Whose agenda? Whose priorities? Revisiting and re-envisioning TESOL's Research Agenda', TESOL International Convention, Chicago, 30 March 2018. [Update, February 2018] Plenary talk by Richard Smith - 'In celebration of Teacher Associations: their value and their potential', at the 25th anniversary conference of NELTA (Nepal English Language Teachers' Association] on 16th February 2018. Based on prior and ongoing discussions with the newly formed NELTA Research Group, this talk launched a new Teacher Association research project on the model of the previous CAMELTA experience (see Smith and Kuchah 2016). A recording of the talk is available here. Pictured on the right are Bhim Gautam and Laxman Gnawali, who will be taking this TA-research project forward, with the NELTA Research Group. [Update, December 2017] Publication of the book Teaching in Low-resource Classrooms: Voices of Experience, edited by Richard Smith, Amol Padwad and Deborah Bullock London: British Council. Open Access. The book is an edited collection of stories of success and of teacher-inquiry. 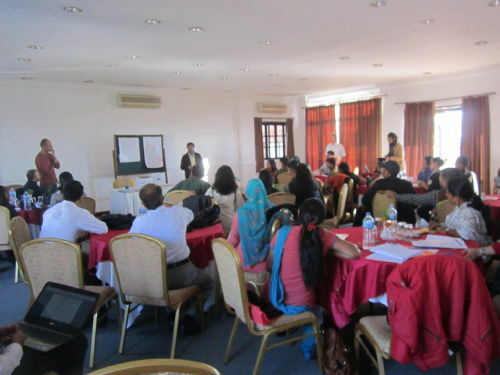 These are authored by members of a group of 34 teachers and teacher educators from Bangladesh, India, Nepal and Pakistan, who came together for a five-day Hornby Regional School in Kathmandu. Based on an ‘enhancement approach’, the materials show that there is particular value for teachers in difficult circumstances in collaboratively sharing examples of successful teaching as a starting point for their own further development. They also show that a useful approach to developing appropriate methodology for such circumstances is teacher research on a basis of initial and ongoing collaborative work. [Update, April 2017] Harry Kuchah gave a talk titled 'Teacher Association Research in Cameroon: recent developments' at the 51st Annual IATEFL Conference in Glasgow, in the context of a symposium on 'Teacher-research for Difficult Circumstances' Video available here. Here is the handout from the presentation (with links to other resources), and the powerpoint slides. Please fill out this questionnaire to give us your feedback about the presentation and join this Facebook group to continue the discussion. [Update January 2016] Teachers from the All-India Network of English Teachers (AINET) Teacher Research Project 2015-16 presented on their projects at the 3rd AINET International Conference in Nagpur. Under the leadership of Amol Padwad, AINET encouraged teachers to take up small action research studies on issues/concerns of their choice, offering them support at every stage of research. [Update, April 2016] Richard Smith has overseen the production of a set of videos with associated reflection tasks for English teachers called Teaching in the Low-resource Classroom: Voices of Experience. The videos and tasks have recently been uploaded to the British Council's TeachingEnglish website. They are based on a five-day 'Hornby school' Richard directed in collaboration with Amol Padwad in Kathmandu, Nepal, in November 2013, repeated in November 2014. 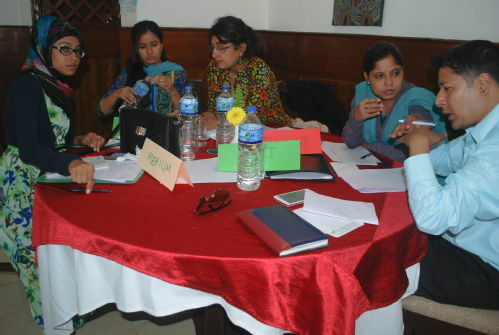 Teachers from Bangladesh, India, Nepal and Pakistan share insights gained from research into other teachers' experiences, in relation to issues faced in low-resource circumstances. [Update, April 2016] Engaging in collaborative research and gaining insights from colleagues familiar with one's own situation underlies the approach adopted for the Teacher Association Research initiative in Cameroon (as described in 'Researching teacher associations' (Smith and Kuchah 2016); see also Smith and Kuchah 2014 and the CAMELTA (Cameroon English Language and Literature Teachers' Assocication) website). Ekembe, E.E. and Fonjong, A.S. 2018. 'Teacher Association Research for professional development in Cameroon'. ELT Research 33. Kuchah, K. and Smith, R. 2018. 'An invitation to Teacher Association Research'. ELTED Journal 21. Smith, R. and Kuchah, H. 2014. '"Teacher Association research": An innovative form of teacher-research' Voices [IATEFL newsletter] (January-February). Smith, R. and Kuchah, K. 2016. 'Researching teacher associations' ELT Journal 70/2: 212-221. Smith, R., Padwad, A. and Bullock, D. 2017. Teaching in Low-resource Classrooms: Voices of Experience, edited by Richard Smith, Amol Padwad and Deborah Bullock London: British Council. Open Access.